Australian Maritime College students have been urged to consider a career in Australia’s growing shipbuilding sector and take advantage of the raft of opportunities soon to be created through the Federal Government’s naval shipbuilding plan. Students, academic and support staff were invited to attend a careers advisory briefing from the Naval Shipbuilding College (College) as part of the delegation’s first familiarisation visit to AMC at the University of Tasmania’s Launceston campus. The College is a national enterprise established by the government to work with key stakeholders to ensure a suitably skilled and qualified Australian workforce is available at the right time to meet industry's needs in delivering Australia's continuous sovereign naval shipbuilding program. The College is managed by the Naval Shipbuilding Institute and supported by AMC as a strategic partner in the development and delivery of key maritime higher education and training programs. The College Program Manager Bill Docalovich spoke about the exciting potential for innovation within the Australian shipbuilding sector and the need for graduates to adapt their careers to suit industry demands. “The College is working with the Australian Government, Defence Industry and training organisations such as AMC to build the shipbuilding capability of Australia’s skilled workforce,” Mr Docalovich said. Australia has exceptional talent and innovative thinkers, the Naval Shipbuilding College is excited to aid in the discovery of its true potential as a sovereign shipbuilding nation. For Bachelor of Global Logistics and Maritime Management students Charles Headlam and Zahara Lemon, the briefing helped provide insight into the potential career paths they could pursue upon graduation. 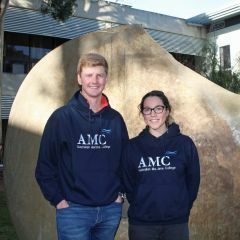 “It was fantastic to see prominent decision makers within Australia's naval shipbuilding industry at the AMC speaking to those who will be working in the industry in the future. While the industry is in early stages of development, the takeaway was clear – there are plenty of career opportunities in this space,” Mr Headlam said. The presentation was extremely valuable and reflective of what I think is a real strength of AMC – industry access and interaction. It’s really important as students to be able to meet those currently working in the industry to help build a picture of where you want to go in the future. Bachelor of Engineering (Ocean Engineering) student Thomas Fallon was pleased to see the industry interest in the skills that he is developing through studying at AMC. The presentation helped reaffirm his career aspirations within the Defence sector. “I have previously taken part in a work experience program at the Defence Science Technology Group, an organisation within the Department of Defence,” Mr Fallon said.